If you decide to spend your hiking holiday in St. Johann in Ahrn valley, an extensive network of trails, which fulfills all desires, waits for you. It doesn’t matter if you prefer it cozy or sporty, if you are just a couple or travel with a pushchair, if you prefer hiking in the mountains or around lakes: The hiking holidays in Ahrn valley and the Zillertal Alps have always something to offer. Straight from St. Johann the Ahrntaler sun paths lead you through the countryside. The routes which belong to theme paths should help you to get to know the region better, because as Johann Wolfgang von Goethe already said: “Only where you were walking, you were really”. Beautiful examples of the sun paths are the alpine cabins tours , where you can enjoy typical dishes from the region, or the witches paths, where especially children have a lot to experience and learn. Who wants to come to his own senses, searches for peace and inspiration, has fun on the high alpine Ahrntaler pilgrim path “Jakobsweg”. Along this way you pass by St. Jacob Churches, which mark the stations along the Jakobsweg. 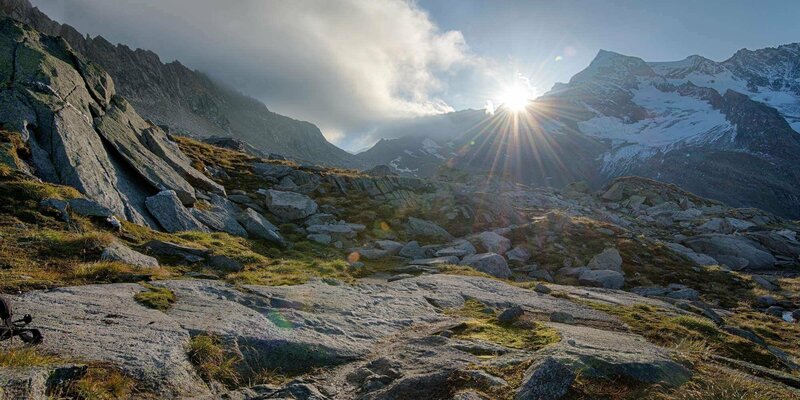 If you like hiking on high alpine pastures, the guided hike “Almlandschaft” is recommended. Along the route that starts and ends at the valley station Klausberg, you go through the beautiful larch forest, exploring the flora and fauna and enjoy the beauty of pastures. Do you prefer something more demanding and take an alpine hike? So during a walking holiday in the Alps you have more than a chance to do it. The mountain experience Klockerklarkopf, a guided hike which passes by the Kehrer and Lahner Alm, offers the opportunity to climb the Klockerklarkopf which is supposedly the most Northern point of Italy. This route requires experience, good physical condition and good equipment. Also suitable for experienced hikers is the Kellerbauerweg starting from the mountain station Sonnklarat Speikboden. The Prettauer high trail is a moderately difficult route that stands out due to the magnificent views of the mountainous landscape.